All it took was a 90-day jail sentence to convince Lindsay Lohan that she is not above the law. The troubled actress has scolded in court for violating her probation in a DUI case by missing weekly alcohol-education classes. The judge, who claimed she "couldn't have been more clear" about her orders, finally gave Lindsay what she deserves: tough love. Lindsay's troubles have been splashed across the tabloids for years. Be it the incessant partying, drug and alcohol charges, theft allegations or bisexual antics, Lindsay's face has sold tons of stories. Now, the wild child will be out of the paparazzi's way while she's in jail and in the court-ordered three months of rehab. 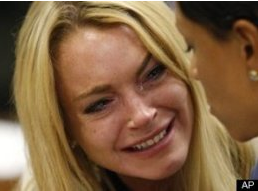 Understandably, Lindsay is very upset with today's news. "I did everything I was told to do, I thought I was being compliant," Lindsay cried to the judge. "I'm not taking this as a joke, it's my life and career. I don't want you to think I don't respect you and your terms." If it wasn't a joke, why didn't Lindsay follow the court's order? This act of tough love is just Lindsay needs. She has been in the public eye since a very young age, and her parents have never restrained or punished her for bad behavior. Michael and Dina Lohan should take some notes from this judge - kids need boundaries. Good luck to Lindsay in jail and let's hope she emerges a clean, changed woman.